Jules O’Brien has now found herself a mainstay of the Hong Kong music scene, having graced numerous Underground gigs as well as recently playing over on Lamma for their Fun Day festival and supporting Pineapple Jam at Lamma Grill. Tonight for London Calling, she’s been up front with us that she’s been battling a cold and we may be getting a husky-voiced version of her rootsy, folk-tinged, acoustic pop. Her first song Paperwork really is a very classic Jules song with her signature finger picking style mixed in with a beautiful percussive, stripped back middle eight. In Between has a sort of lullaby feel to it and I love how she comes down the fretboard for a couple of harmonic type sounding notes which seem to push the song structure beyond what we were expecting. So far, we’re not seeing any of this flu she’s supposed to be fighting off. A very convincing brave face. There’s lots of Kate Nash’s influence all over Chopstick – a comparison I’m sure she’s heard before. She squeezes her lyrics into bars and then drags them out, nicely mixing up her rhythm and form. Easily my favourite song of hers is Bad One For A Friend which feels very Arctic Monkeys inspired. Its story is surely a well-trodden path of dating someone who was a “nice guy, but a bad boyfriend”. Even so, I’ve not heard it in a song before and it’s a beautiful observation of the human condition I feel. Gold typifies Jules style with a mix of rhythm, finger-picking and percussive guitar, but stepping away from her usual angsty themes towards a more mature one with passionate desire and unrequited love. With wonderful variation on this song again, I feel the box she writes her songs in is much bigger than the average bear, if you get my drift. She loses her way a bit on This Town, a newer song that perhaps she hasn’t quite got as comfortable with as the rest of her set. Despite this, it sounded good and the high notes really seemed unaffected to me by her cold. I enjoyed the simpler arrangement; easier for the ear to latch on to. She turns up the reverb on You Won’t Be Down Forever, sonically creating a dreamy quality; one which would be interesting if she pursued more intently. The super-sweet humming outro gently wakes Morrison Café from our dreamlike trance. She concludes her set with We’ll Both Look Back which returns us to her acoustic-roots style for a final tale of misplaced love and broken hearts. There’s no question her Hong Kong star is rising. I hope she does another gig with a cold. I’ll be there. 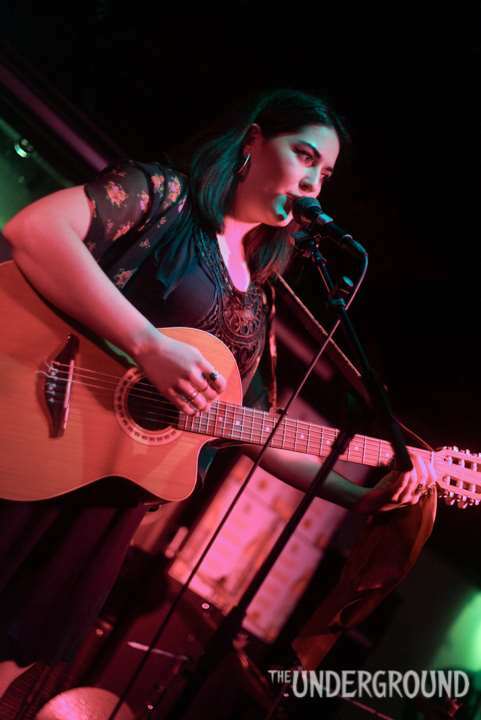 Sporting a silvery-blue smoky eye look and ripped jeans, singer-songwriter Jules O’Brien took to the stage with her nylon guitar, amidst of a roomful of folk music enthusiasts. Within just two to three bars of her song, ‘In Between’, she has managed to not only capture our imagination with her hauntingly beautiful vocals, but also take us along on an emotional roller coaster ride. “Suddenly I’m shaking like a child/Breathing as the air is getting colder,” the heartfelt words in her lyrics and minor chord progressions made the intimate venue even more so than before. I always thought that without the help of vocal effects or guitar pedals, acoustic sets would lack variation and sound repetitive after the first three songs. However, Jules proved me wrong with her impeccable percussive guitar techniques while performing her song ‘Paperwork’. In the blink of an eye, she turns her guitar into a drum set, sweeping us off our feet with those mind-blowing percussive beats. Things could get a little messy when you try to fit a dozen words into just one bar. However, just like Ed Sheeran, Jules has found a way for it to work, and instead of being out of sync with the melodies, the tongue twisters in the verse create a forward momentum that help it gradually build up to a powerful chorus. ‘Bad One For A Friend’ was a personal favourite of mine, as it has a rather dark tone to it, and thus changing the dynamics of the whole set. Also, this song really brings out her sassiness and you can really see her coming out of her shell as she effortlessly brings the house down again. After asking the sound engineer to turn up the reverb, she began serenading us with a beautiful ballad called ‘You Won’t Be Down’. Her penetrating and breathy vocals reverberated around the room, and surprisingly, the guitar strums were brought forward in the mix, which then creates a contrast between the two. Her last song of the night, ‘We’ll Both Look Back’ could very well be interpreted as a love letter to Hong Kong or an anthem for all the youngsters here, in which she sings about how it feels to be in an all-consuming relationship as well as navigating through a megacity as a young adult. Besides her mesmerising voice, I’m in awe of her high level of professionalism and the way she handled slip ups as well as tech issues such as audio feedback—she simply laughed it off as if nothing had happened and picked up where she left off without missing a beat. “I’m giving this song three goes before I give up,” said Jules O’Brien after fumbling the opening to her first song. A second attempt proved more successful, but her faith faltered mid-way through and she gave up. Not only was it incredibly brave – the first song of a busy Girls With Guitars night – but also hugely endearing. It led into a set of similarly intimate, emotionally wrought songs offering a window into the British singer-songwriter’s mind, upon which themes of change, life’s crossroads and complications of the heart lie heavy. Shaky at first, O’Brien’s distinctive and powerful voice grew to fill the room as she gained confidence; lyrics tumbling like the narrated pages of a diary. Any embarrassment was fleeting, as she went straight into “a song I actually know how to play”, We’ll Both Look Back. On the tango-led Chopsick – O’Brien’s voice simmered with passion and chagrin, evoking the searing intensity of Anna Calvi. On several occasions, her soft, almost spoken-word delivery echoed Laura Marling’s, while meandering, pondering lyrics had Joni Mitchell’s influence woven through. Four relatively reigned-in, gently-picked songs culminated in Paperwork and Love Affair; the former a gradually building, stunningly executed ballad recalling the guitar flourishes of Marling’s Sophia. Meanwhile the latter was sweetly-picked with a tear-jerking chorus – a reconciliatory coda completing a collection of songs that seemed to chart leaving a native country for adventure abroad, and the inevitable accompanying emotional turmoil. An astute and captivating performer, O’Brien and her laid-bare demeanour will linger in the memory for some time. With her dark bangs, winged eyeliner and quietly sweet demeanour, Jules O’Brien is the Zooey Deschanel-esque manic pixie dream girl of Hong Kong. Acoustic sets often eventually meet with the inescapable fate of being boring, but here, even though Jules employ the same indie-folksy tune throughout, the variety of styles she takes on, from heartfelt and honest to quirky and naughty, keeps the audience enthralled throughout the night. In Chopsick, she sings of heartbreaks (“I miss you all the time but I hate to think whose hand you’re holding.”) and evokes images of Paris in the rain in “(song before Chopsick)”, and takes on a darker battle-hymn tone in “(the song with the lyrics out of heaven into hell)” – a personal favourite of mine that evening. Her voice is one of those you want to listen to over and over again – clear, crisp and her lack of deliberate flourishes makes the whole listening experience immensely enjoyable and easy on the ears. Her songs usually follow the pattern of starting off with slow and soft fingerpicking, then progressing into a chorus or bridge of intense, impassioned strumming, and her emotions flow easily like syrup from a maple tree. A great way to start off the night, a superb girl with guitar indeed. The night began with Jules O’Brien who, I can say without hyperbole, has among the best voices I’ve yet heard at the Underground. The natural richness of her voice and its mid-to-low range combines to create a smooth timbre that’s immensely pleasing to listen to, something like an Olivia Olson. An huge added bonus (to me) is that she uses none of the all-too-common annoying affectations that are such a plague among female singers; it’s just straight-out singing, that sounds good, and the lack of affectation adds a feeling of honesty and innocence that’s almost impossible to engineer. This is added to by lyrics, of which there are many, and which are said at a rapid pace yet gently. It’s as if she wanted to fill every second with as many words as possible, and this has the effect of giving the songs a bubbling texture, completely aside from everything else. This was particularly well-done on the 80’s acoustic-pop-like You Won’t Be…, or on Bad One for… which was more Latin-y in the vein of La Camisa Negra. She backs this up with a distinctive guitar style; she occasionally employs fingerpicking, and also strums her chords so that each string can be individually heard, rather than the chord sounding like a more or less united element of music, much like solo folk singers tend to do, or the way the guitar sounds on RHCP’s Breaking the Girl. This, when combined with the way she sings her lyrics, gives a cascading texture to her songs, and the combination is very pleasing to listen to, although she may need to get a guitar that doesn’t keep going out of tune as hers did on the night. There are, of course the slower-sung songs, like the Leonard Cohen-esque Love Affair which sounds a lot like a song you’d hear playing at the back of a crucial moment in a serious film. While she plays to the strength of her voice by having her songs stay mid-range, but the downside of this is that the set drags on you a little towards the end; it would be an interesting addition to her set to have a couple of songs that are ‘up’ moments, and have her sing a little higher, just so that she could play with the dynamics of her show. In any case, it was a very easy-on-the-ears set, and a very good way to start the show.